A former Minister of State for Defence , Senator Musiliu Obanikoro Tuesday, admitted before a Federal High Court in Lagos, that he was investigated by the Economic and Financial Crimes Commission (EFCC) for being privy to illicit transfer of funds. Obanikoro made the statement while giving evidence in the criminal trial of immediate past Governor of Ekiti State, Ayodele Fayose, facing charges of N6.9 billion fraud. Fayose was arraigned by The Economic and Financial Crimes Commission (EFCC) on October 22, 2018, alongside his company Spotless Investment Limited, on 11 counts. He pleaded not guilty to the charges, and the court had granted him bail in the sum of N50 million with one surety in like sum. Trial commenced on November 19, 2018, with the EFCC calling four witnesses, while the court had then adjourned for continuation of trial. At the resumed hearing of the matter on Tuesday, Mr Rotimi Jacobs (SAN) appeared for the EFCC, while Messrs Ola Olanipekun (SAN) and Olalekan Ojo (SAN) represented the first and second defendant respectively. Obanikoro, the fifth prosecution witness who had began his evidence on January 21, and cross examined on February 4, mounted the witness box in continuation of his cross examination. Obanikoro during cross examination by second defence counsel, Mr Olalekan Ojo (SAN), told the court that during his tenure as Commissioner in Lagos in charge of Home Affairs and Culture, he had interfaced with various security agencies in the discharge of his duties. According to him, he had sourced for an outfit known as Silva Mcnamara, owned by one Kareem Taiwo, to the office of the National Security Adviser, (NSA) when the need arose to provide for security operations in Lagos State. Witness replied: “Well, I have not been discharged to the best of my knowledge. The witness replied No, but added that the office of the NSA had responsibility for coordination of security across the nation, some of which are clandestine and not documented. Subsequently, Ojo sought to tender an extra judicial statement made by the then Special Assistant to Obanikoro, Mr Justin Erukaa and the Prosecutor raised objection. Following the objection by prosecution, Justice Mojisola Olatoregun adjourned the case until February. 6 by 9.am , for counsel to address the court on the admissibility of an extra j-udicial statement. According to the charge, on June 17, 2014, Fayose and one Agbele were said to have taken possession of the sum of N1.2 billion, for purposes of funding his gubernatorial election campaign in Ekiti State, which sum they reasonably ought to have known formed part of crime proceeds. The accused was also alleged to have used the sum of N200 million, to acquire a property in Abuja, in the name of his elder sister Moji Oladeji, which sum he ought to know also forms crime proceeds. The offences contravenes the provisions of sections 15(1), 15 (2), 15 (3), 16(2)(b), 16 (d), and 18 (c) of the Money Laundering Prohibition Act 2011. 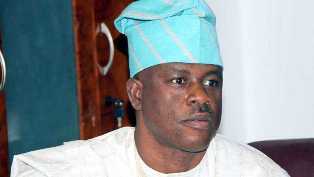 Be the first to comment on "N6.9B Fraud: I was Investigated For Financial Crimes–Obanikoro"